Once there was a young woman named Tira. She had moved all over the island of Java. She was founding her salty fish perfume kingdom to support her dream of becoming a lecturer. But two mighty winds always assaulted the hot air balloon she traveled in. The first wind was peer pressure. It would swing her into karaoke bars. It blew cigarettes into her hand and mouth. It was a tricky wind. Sometimes it was so tricky she thought it was taking her where she wanted to go. The other wind was called love. This wind was not so much tricky as tyrannical. It would spin so quickly that she could not land. One time it spun for nine years. She was very dizzy. And when she finally landed she had to continue reminding herself that wind was only “called” love. But one day when Tira landed, a pale mountain goat approached her. Some people said the goat was as wily a trickster as the wind peer pressure. Others said the goat was as tyrannical as the wind called love. The goat had been practicing to become a wise hermit in the mountains. His loves had made fun of him because he had only a right horn and two ears on the left side of his head. The goat looked at its front hoof to avoid staring at the beautiful Tira. “Yeah, well, I could take you for a riiiiiiiiide, if you want,” the goat bleated, attempting to maintain a smooth voice. “Hmm,” Tira replied. She did not want to delay her quest for lecturedom nor postpone her hopes of having children. 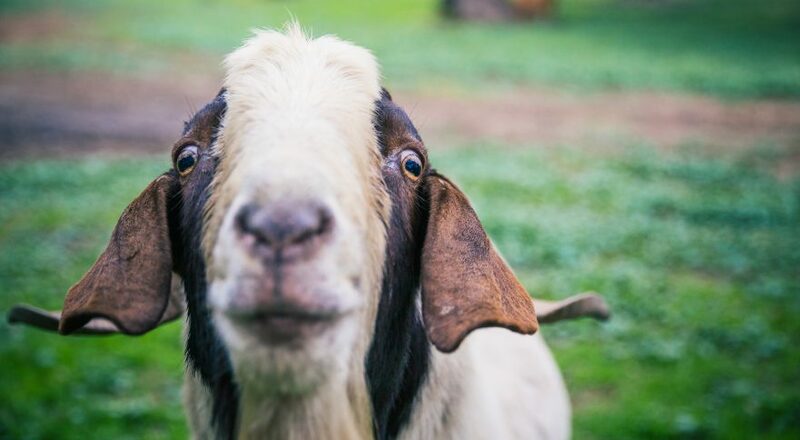 “I feeeeeeeeel you,” said the goat, dropping its hoof to kick at a clump of grass. The goat struggled, its front legs over the side of the balloon’s basket. Tira pushed. But the goat could not manage to get into the balloon. “Your baaaaaaaaalloon obviously hates goats. What’s up with that?” The goat asked. Tira felt a bit sorry for the cumbersome, one-horned goat with two ears on the left side of its head. “Well, if you just want something fun to remember, I will go for a ride on you.” Tira smiled, climbing onto the goat. She stroked the goat’s ears. “How special that both ears are on the same side. How did you come to be this way?” Tira held onto the goat’s neck as he began to run furiously. “Well, it’s no curse to be special,” Tira said looking back in the direction of her balloon. The goat reached the top of the mountains where a small lake reflected the blue sky and white clouds. “Is this your home?” Tira asked. “Why did you bring me here, so far from my balloon?” Tira began to look for a way down. The goat lowered his head to the strawberries. “Have some strawberries first. They are delicious, a rare delight here… all alooooooooone.” The goat lifted his head from the strawberries. “Maybe I want to have fun every day aaaaaaaaand remember each day as fun.” The goat’s little white beard was swinging in a wind. The wind was the wind called love. It slowly began to grow. And as the wind grew it began to push apart the clouds. Tira’s eyes were becoming moist. She looked up to control the water and hide it from the goat. Then she noticed something coming out of the clouds. It was round and yes! It was her balloon! She nearly burst into a gasp. But she was taken aback by the goat’s intense stare. She wondered how her balloon could be floating to her. The goat finally noticed that something had caught Tira’s attention. He screamed when he saw the balloon. He gnashed his teeth. He pounded the ground with his hooves. And flailed and rolled atop the strawberries. “It is a man. He’s come to take you awaaaaaaaaay from me.” The goat was sick. His insides twisted and writhed. Tira moved toward the goat with her hand out. She understood the sorrow. “But you are a goat. And I am a woman. You have known this.” She stroked the goat’s heaving, sobbing side. The wind was so gentle with her balloon she hardly believed it was the same wind called love. “But you rode me here. Weeeeeeeee had fun.” The goat struggled to right itself to its four legs. “There must be a place of goats,” Tira whispered listening to the salty fish perfume banners on her balloon growing closer as they flapped in the wind.